Cannelloni stuffed with ricotta cheese and fresh herbs, pesto sauce. Green asparagus shoots served lightly steamed and raw with a creamy parmesan sauce and crispy ham. Filet of fish ( subject to availability) with its virgin sauce accompanied by French beans, green peas, broad beans, spring onions, tomatoes, black olives, lemon confit, parsley and chives. Duck breast served with a cumin spiced carrot purée and gravy. Strawberry gazpacho, a carpaccio of freshly sliced strawberries, pine nuts and fresh basil with a yogurt ice cream. Apple crumble with home made toffee served with ice cream. Please note : The menus listed are only samples. Marie will elaborate with you a private menu according to the seasonal fresh products. Chef Marie made my 60th birthday celebration the best! Amazing talent. Wish we had booked her a couple of more times during our stay. Chef Marie provided the best meal of the week. The service was great. The meal was gorgeous with great flavor. Chef Marie was FABULOUS. Adults and kids alike ate up every bite. Marie (the chef) was as last year quite outstanding and a very nice person. Thank you for coming to Figon last evening to prepare dinner for my friends and me. Your creation was delicious & every taste enjoyable! I would absolutely recommend Chef Marie to anyone who wanted to have the ultimate Provence experience. We cooked at home every day except for the delicious meal Marie prepared for us. She was delightful and didn’t seem to mind our questions about what she was doing in the kitchen. Chef Marie prepared a delicious meal that we all enjoyed. Thank you for such an outstanding experience. I want to thank you again for preparing such a wonderful meal for my family last night. All five of us loved it! It was absolutely delicious and the presentation was beautiful. Vous etes vraiment une artiste! I think it is a meal we will remember for a long time. It was also a pleasure to meet you. Thanks again for being a part of our Provence vacation. We hope to see you again! We had Chef Marie, who made us a terrific meal and was so kind and efficient. We LOVED Marie! She made a superb meal for us and she was as lovely as could be. It was wonderful to celebrate a really memorable birthday. Everything was great from presentation to the amazing food to a very clean kitchen. We are very grateful. Please thank her again for us! 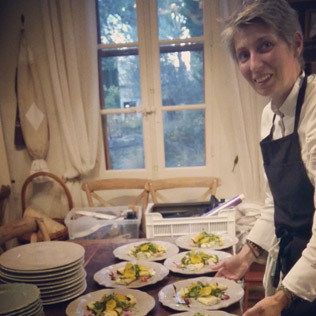 Out of this world… our meal with Marie was one of the best moments of our week at Mas de Gancel. It was clear that she loves all that is seasonal, wth an emphasis on vegetables. For any group catering to vegetarians— Marie is a wonderful option. Marie is kind, passionate, and so very talented… Will definitely have her again. We love chef Marie, she made a fantastic meal for us. The chef experience was also very good. Chef Marie's food was delicious - it was a bit on the pricy side which is the only comment. We chose Chef Marie to come to cook a meal one night. She was so sweet and talented - a definite highlight of our time in Provence. While there, the ground team also helped us make dinner reservations at great restaurant. We felt very well taken care of! We loved Chef Marie. She was very sweet and her meal was delicious as well. It was the highlight of our visit and by far the best food we had in the area. Thanks again for everything. Marie is totally wonderful... Great chef, and such a lovely lady. How perfect is our life in Provence.... Much, much thanks to you. Chef Marie cooked the most amazing meal for us….we are still talking about it! The dinner was fabulous and Chef Marie delightful. Thank you once again for helping us organise such a wonderful experience. Marie had so much time for our 5-year old daughter, Jade, who was delighted to participate! We have fallen in love with Chef Marie. She is a true artist and a gentle spirit. We are very grateful for the fantastic meal that she prepared for us tonight. Marie was exceptionally accommodating with so many children( one gluten free) and adults( one pescatarian) to cook for. Her food was absolutely delicious. We were absolutely delighted with Chef Marie and her dinners. The food was truly excellent and the presentation first class. In addition, Marie herself is very pleasant and was very unobtrusive around the villa. We could not recommend her enough! She arrived on time and was totally professional. She was also charming and quickly grasped the mood of our group. Her food was very good and well presented. She left the kitchen clean and tidy with plates and cutlery in the dishwasher. It was a pleasure to be served by her and she wrote us a short note saying she had enjoyed it too. Can’t be better than that! We had Marie come and cook a dinner for us. She was marvelous! Her meal was delicious. She was friendly and extremely efficient. She had amazing ingredients and was a pleasure to interact with in French, Portuguese and some english. Truly a lovely evening.